There is an old saying 'a chain is only as strong as its weakest link.' A recent ram-raid of an Anaconda outlet in Frankston has demonstrated that this concept can also be applied to bollards. Despite the presence of bollards around the perimeter, thieves managed to find a vulnerability within the installation allowing them to crash a stolen Ford Territory through a roller door, fleeing with a large amount of clothing and leaving a massive clean up bill for the owners. 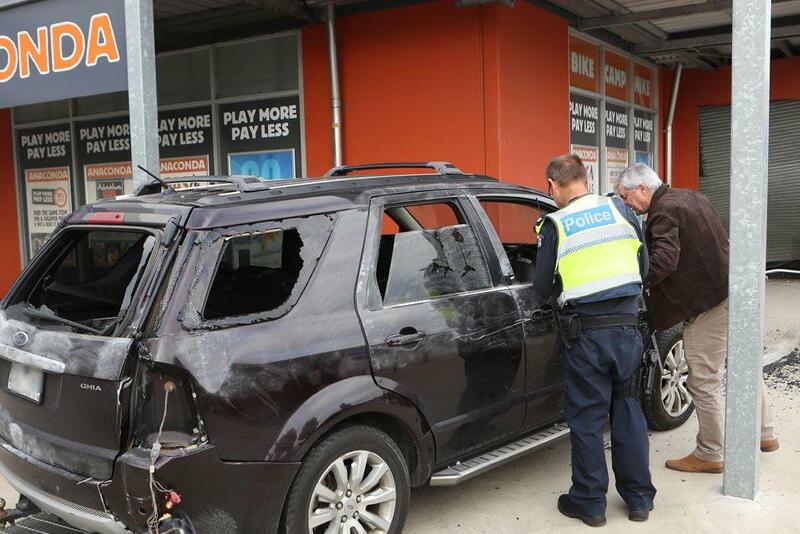 The Anaconda outlet on Cranbourne Road was rammed about 6.30am by three male offenders. They were able to mount the kerb, drive along the footpath and squeeze the vehicle through a narrow undercover section before crashing through a roller door at the outlets entrance. Despite eight bollards securing the windows, the oversight of not protecting the roller door has brought the outlets security measures undone. At Barrier Group our trained experts are able to assess and advise of the best methods to protect your business from potential harm. During a site consultation we are able to detect any vulnerabilities that may be present a recommend a solution so your business is no longer exposed. In this case, removable bollards installed in-front of the roller door may have been enough to thwart the thieves attempts of forced entry. If you feel your business is vulnerable please call 1300 55 33 20 or contact us for a site consultation.